Karen Carney scored the only goal of the game as Birmingham City beat Liverpool to register their first Women's Super League win of 2015. 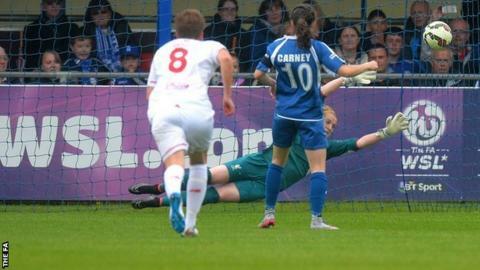 Carney netted what was Birmingham's first league goal at home this term, converting from the penalty spot after Martha Harris handled the ball. Reds goalkeeper Libby Stout did well to deny Kirsty Linnett and Jo Potter either side of the break. In response, Katrin Omarsdottir and Ashley Hodson both fired over the bar. Victory is Birmingham's first since their season-opening triumph over Liverpool in the fifth round of the FA Cup and ends a 10-match winless run. It eases pressure on David Parker's relegation-threatened team as they move four points clear of bottom side Bristol Academy and to within three points of Liverpool in sixth. Birmingham City: Spencer; Windell, Mannion, Harrop, Carter; Allen, Moore, Potter ; Lawley, Linnett, Carney. Substitutes not used: Sargeant, Wellings, Edwards, Westwood, Haines, Peplow. Liverpool: Stout, Easton, Bonner, Longhurst (Schroder 78) Harris; Staniforth (Ryland 56), Omarsdotir, Zelem; Smorsgarred (Hodson 56), Dowie, White. Substitutes not used: Derbyshire, Green, Dale, Pactieco.